Pacific poison-oak is common in western Oregon and Washington. Its near relative, western poison-ivy, is found in eastern Oregon and Washington, throughout Idaho, and eastward. These plants are so similar in their appearance, growth, effects on humans, and responses to control efforts that their common names are often interchanged. Pacific poison-oak and western poison-ivy often grow in fencerows, waste areas, evergreen forests, woodland savannahs, hill pastures, clear-cut forests, stream banks, wetlands, and rocky canyons. Both plants are native to the Pacific Northwest. Outdoor recreationists, land managers, forest and conservation workers, and wildland firefighters are most frequently exposed to these plants. All parts of Pacific poison-oak and western poison-ivy plants (except the pollen) contain an oily substance, urushiol (pronounced: you-ROO-shee-all), that is present throughout the entire year. Exposure to urushiol can cause an allergic contact dermatitis reaction that includes painful irritation and blistering of the skin and, if inhaled in smoke, the lungs. Individual reactions vary from extreme susceptibility to near immunity. Many people are immune when young but suddenly or gradually become sensitive with age, possibly due to sensitization through repeated exposure. These two plants can substantially limit the use and enjoyment of our natural environment. Pacific poison-oak and western poison-ivy are in the sumac (Anacardiaceae) family. The current scientific names are Toxicodendron diversilobum for Pacific poison-oak and T. radicans or T. rydbergii for western poison-ivy. Previous names are Rhus diversiloba (Pacific poison-oak) and Rhus radicans (western poison-ivy). 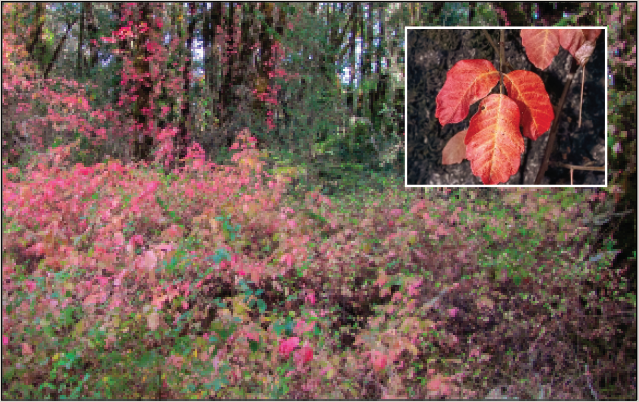 Note: This publication does not address related plants (eastern poison-ivy, Atlantic poison-oak, and poison sumac) that occur in other areas of the United States but not in Oregon, Washington, or Idaho. Pacific poison-oak and western poison-ivy have many growth forms and leaf shapes, depending on the environment in which they are growing. 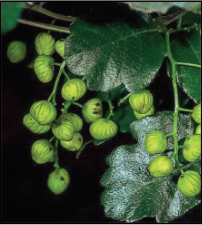 Both species grow as shrubs reaching 3 to 10 feet tall in height (Figure 1). Pacific poison-oak can also grow as a ground vine (Figure 2) or as a woody vine that can coil into and around trees and larger shrubs for over 100 feet (Figures 3 and 4). Pacific poison-oak and western poison-ivy are readily identified in the landscape by their leaves. Leaf color of both plants can vary from green with hints of red when young (Figures 5 and 6), to dull or shiny green, to shiny red in the fall (Figures 7 and 8). For both species, the leaf surface texture can be glossy or may have a blistered appearance. The leaves alternate on the stem, and each leaf is typically made up of three leaflets. Leaflets are 1 to nearly 6 inches long and resemble oak or ivy leaves. The lobes on the leaflets are often irregular and may vary, even on the same plant. The tips of western poison-ivy leaflets are sharply pointed (Figure 9), while Pacific poison-oak leaflets are more rounded and irregular in shape. Plants may remain vegetative or may develop flowers and fruit. Flowers are greenish-white, about ¼ inch across, and are arranged in clusters on a slender stem (Figures 10 and 11). The fruits are white, berrylike, glossy, and dry when ripe, with a striped seed inside the papery shell. 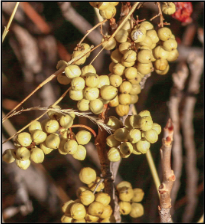 Berries of western poison-ivy are about ⅙ inch in diameter, whereas those of Pacific poison-oak are slightly larger (Figures 12 and 13). Both species reproduce by seed and by underground rhizomes. 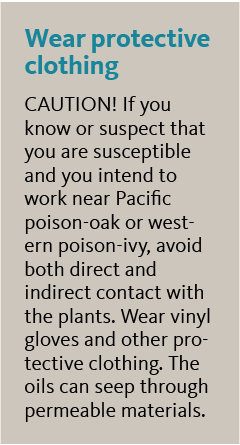 Avoid direct contact with Pacific poison-oak and western poison-ivy plants in the landscape. Avoid an allergic reaction by avoiding contact with the plant and the urushiol contained in all plant parts—even during the winter dormancy. Learn to identify the plant and avoid touching or rubbing against it. If you must handle the plant, wear loose-fitting clothing or coveralls, and vinyl gloves to protect the skin from direct contact with the oil. Consult with your physician about the use of specially designed skin creams, which may provide a physical barrier. 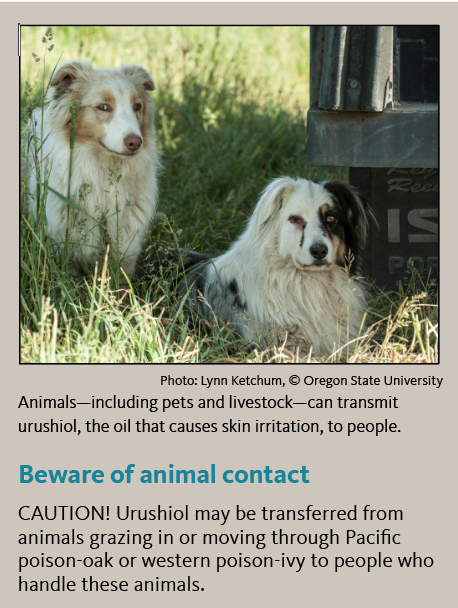 Avoid contact with urushiol-contaminated items. The oil can remain viable for long periods of time on gloves or other clothing, tools, equipment, animals (including pets and livestock), and firewood. The oil can be degraded by carefully washing these items and animals with soap and water after exposure. Wash exposed pets with soap and water to remove the oil from fur. Wash any clothing or exposed fabric items (like bedding, pet collars, etc.) with soap and water. To avoid cross-contamination, do not wash contaminated clothes with other clothes. Take care to rinse the washing machine thoroughly. If dermatitis occurs even after laundering, dry cleaning or disposal of infected items may be necessary. Tools and equipment can also be rinsed with soapy water. Take care during the washing process to avoid transferring the oils to your skin (wear protective clothing and vinyl gloves). Inhalation of smoke in close proximity to burning Pacific poison-oak and western poison-ivy has caused allergic reactions in people who were otherwise considered immune. Any transmission from smoke is by droplets of urushiol on particles of dust and ash in the smoke, rather than from volatiles (the gas or vapor form of urushiol). Inhalation of this smoke can cause respiratory tract inflammation and generalized dermatitis of the skin that can require hospitalization and intensive care. Avoid adding plants to burn piles. If working in close proximity to burning plants, respirators with specially designed filters may be effective to keep urushiol-contaminated dust and ash particles from entering the respiratory system. What to do if you’ve been exposed or are showing symptoms or both? Wash your skin with soap and water as soon as possible after exposure. Take care to avoid spreading the oil to new, unexposed areas of your skin. Contact medical professionals for current recommendations on symptom management (itching, swelling, etc.). Seek medical advice through your physician’s office or poison control center, especially if large areas of the skin are exposed, smoke from burning plants is inhaled, or children or other vulnerable populations are involved. Take care when using home remedies to manage symptoms—many of these techniques have not been proven effective and may worsen the problem. 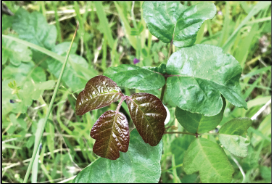 Generally, Pacific poison-oak and western poison-ivy are not considered to have significant ecological value, as many nonpoisonous and desirable plant species (both native and introduced) provide equal or better animal forage and erosion control. However, complete eradication from natural areas is not necessary. Management decisions should be dictated by land-use patterns (such as removal from trail edges where contact with humans, pets, and livestock may commonly occur). Burning is not recommended due to health concerns. Several effective management methods are available, including mechanical and chemical control options. Pacific poison-oak and western poison-ivy plants can be removed by digging out the roots or hand pulling in areas that contain valuable ornamentals. Remember that the roots and stems removed during grubbing and pulling contain urushiol and can cause a reaction. All precautions to limit exposure to skin discussed previously should be followed. Persons who are sensitive to urushiol probably should not attempt hand methods of control. Roots can be removed most easily when the soil is thoroughly wet. Grubbing or pulling when the soil is dry and hard is almost futile because roots break off in the ground, leaving large pieces that can sprout vigorously later. Pacific poison-oak vines growing on trees should be cut at the base. Often, tree branches and vines are so intertwined that removing the vines is impossible without injuring the tree. Mowing is generally not an effective means of control. It has little effect on roots unless it is repeated frequently. Cutting plants will expose the sap and can present considerable risk to those who might come into contact with it. 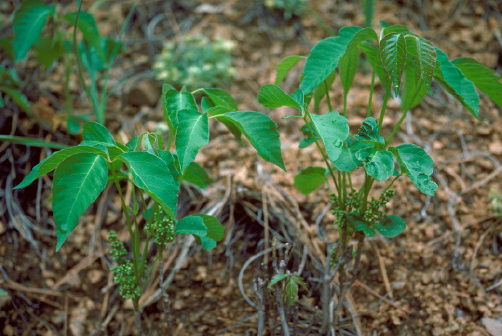 Within 2 months of germination, most Pacific poison-oak or western poison-ivy seedlings have a robust root system and cannot be controlled by a single mowing. The plants will grow back if only the top of the plant is removed. Seedling plants at the end of the first year have well-established rootstocks that only digging, grubbing, or herbicides will kill. Seedlings will persist as long as seedbearing plants are in the general area. A single tillage event is of little value in combating Pacific poison-oak and western poison-ivy, but multiple tillage operations for seedbed preparation and planting of cultivated crops for 1 or 2 years will provide control. Though some animals, such as sheep and goats, graze Pacific poison-oak and western poison-ivy and may limit abundance of those plants, grazing will not eliminate these weeds or stop their spread unless it continues intensively for several years. No parasitic insects, pathogens, or microorganisms have been found to suppress Pacific poison-oak or western poison-ivy. Several commonly available brush-management herbicides may be used to control Pacific poison-oak or western poison-ivy. Specific recommendations will depend on the type of land (small woodland, commercial forest, public recreation area, etc.). Consult the resources for more detailed information. There are many products with various trade names available to users, but herbicides containing the following active ingredients or mixtures of these ingredients control Pacific poison-oak and western poison-ivy well: glyphosate*, dicamba*, triclopyr (alone or in a combined product with 2,4-D*), metsulfuron, aminocyclopyrachlor, and aminopyralid. Active ingredients marked with an asterisk (*) are available to home/noncommercial users. Products containing glyphosate are nonselective and have the capacity to kill or injure all plants, while others, including dicamba and triclopyr, are selective only to broadleaf plants, including desirable trees and shrubs. Glyphosate and growth-regulator herbicides (including 2,4-D, triclopyr, and dicamba) can damage valuable plants such as ornamentals and must be carefully applied. 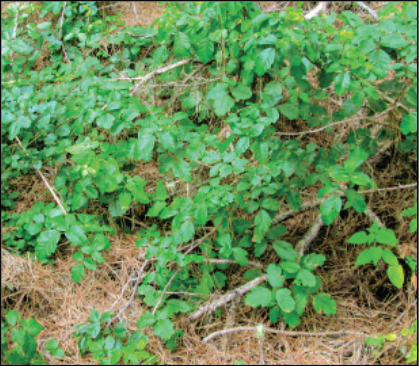 Selective herbicides can remove Pacific poison-oak and western poison-ivy without destroying desirable grass. However, products containing glyphosate and triclopyr are likely to be the most effective and affordable over time. Refer to the “Control of Problem Weeds” section of the Pacific Northwest Weed Management Handbook (https://pnwhandbooks.org/weed/control-problem-weeds) for specific commercial recommendations on use rates and tank mixes for some of these herbicides when managing Pacific poison-oak and western poison-ivy. These products may be purchased from most agricultural supply companies, and some of these herbicides may also be obtained in pre-mixed, ready-to-use forms in small consumer packages in lawn and garden stores. Herbicide application timing depends on the application method. 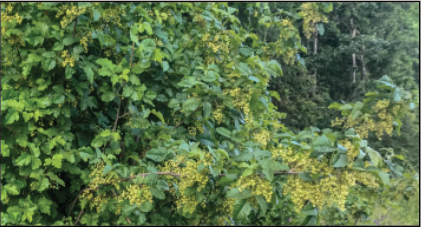 Foliar treatment of established plants should be done in the late spring or early summer (June in most areas) after Pacific poison-oak or western poison-ivy are in full leaf. Any foliage regrowth and plants that were missed should be resprayed the same year during the fall, prior to leaf drop. Herbicides may drift if sprayed during breezy conditions and may volatilize and move off-site in warm weather. Careful application is required in areas where susceptible plants are growing; only treat the desired plants during application. 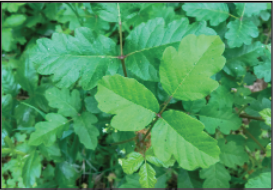 Pacific poison-oak and western poison-ivy can also be effectively controlled by treating the lower stems (basal bark methods) with herbicides and adjuvants registered for such uses during the winter, when the plants are leafless and dormant. Winter application is relatively safer than in other times of the year because there are fewer ornamental and other valuable plants actively growing that may be injured by carelessness or accidental spraying. Also, leafless stems provide less chance of the applicator being exposed to the oils produced by the plants. As with most perennial weeds and unwanted vegetation, repeated applications over several years are needed for complete control. 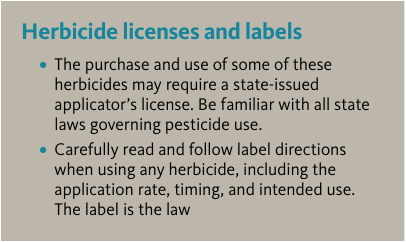 For more details on suggested herbicides and specific use rates, refer to the Pacific Northwest Weed Management Handbook (https://pnwhandbooks.org/weed). National Capitol Poison Control factsheet. Poison Ivy, Poison Oak and Poison Sumac: Prevention and Treatment. 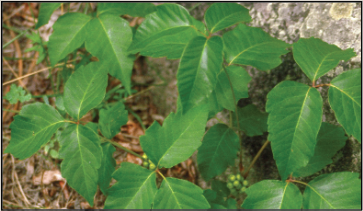 Online: https://www.poison.org/articles/2014-oct/poison-ivy-oak-and-sumac.